In 1990, Lancôme unveiled the now legendary Rouge Absolu. In 2008, it was succeeded by L'Absolu Rouge, a creamy lipstick boasting a satin finish with colour that's sumptuous and vibrant, yet always wearable, offering instant moisturisation and even longer-lasting comfort. Pure perfection by Absolu. To house this treasure, Lancôme imagined a black and gold lacquer case, inspired by the refined gold case for the Clef de Coquette lipstick created by Armand Petitjean in 1951. Its practical magnetic cap is stamped with a golden rose. Its deliciously luxurious click is instantly recognisable and rapidly addictive! Once opened, the tapered stick nestled within its golden cylinder once again features the Lancôme rose. Today, Lancôme is paying a two-fold homage to women's beauty by coupling its most sophisticated lipstick with its emblematic flower. Created through a cutting-edge procedure, the to-date inimitable colours of 10 legendary roses complete the range of a lipstick already a legend in its own right. The rose remains and always will be an endless source of inspiration for the French maison … Ten legendary roses, ten fascinating stories, ten exceptional and inspiring new shades, brimming with life: because Lancôme is inseparable from the rose and vice versa. L'Absolu Rouge thus writes a brand new chapter in the love story that has intertwined the brand and the flower since 1935. A symbol of beauty, colour, freshness and sensual pleasure, but also of passion, emotion and seduction, it was only natural that Maison Lancôme founder Armand Petitjean should take a special interest in the flower, passionately cultivating it in the gardens of his Ville D'Avray villa, while creating his first ever fragrances and one of the brand's first ever lipsticks, Rose de France. In 1973, Lancôme finally had its own rose, designed by one of the world's greatest rose 'inventors." A dense fuchsia bloom whose delicateness is balanced by strength. One of ten flowers transformed into lip colours today. In 1973, one of the world's best-renowned horticulturalists and rose growers, Georges Delbard, spent many months designing a brand new species of this most famous of flowers. The delicate art that is creating a new variety is above all an alliance of two forms of beauty, specially selected to bestow specific qualities on a third. Throughout the hybridisation process, each of the two parent roses plays its role (one pollinating the other through the rose grower's skill) and this role will determine the qualities passed on to the new flower. It takes hundreds of trials to achieve the dream combination that the new variant's creator had imagined. Born of an ingenious fusion between a magenta rose and a mauve variety, the new flower created for Lancôme by genius grower Georges Delbard is dressed in a rare, deep fuchsia – a vibrantly pure hue. Stronger and fuller, it has a remarkable capacity to adapt to its environment, with its thick, glossy petals and very long bud, offering it a refined and slender silhouette. Delicate in its strength, with a distinct personality and unforgettable beauty, it is still grown forty years later by Arnaud Delbard, its creator's grandson. Once a year, it emerges from the earth of its birth in the village of Malicorne, in the Bourbonnais province, Allier, France. Annual production is restricted to just a few thousand plants. 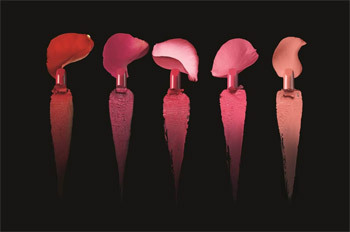 Lancôme went in search of colour where it expresses its purest radiance, at the heart of roses, by developing a colorimetric extraction technique to recreate their vibrant colours in lipstick. Radiantly luminous and pigment-infused colour is 'extracted" from the very heart of each flower. Thus the world's most beautiful flowers become a genuine source of lipstick shades. Each petal undergoes chromatic analysis to reproduce its exact shade using a spectrophotometer, which is a photosensitive cell coupled with a computer, recording the light reflected by the rose petals. Thus converted into colorimetric values, this data is then used to faithfully reproduce the roses' true colours. Thus the exact dose of pigments and mother of pearl is added to the lipstick base thanks to the colourist's skill to achieve the rose petal's exact colour. The lipstick texture is then transferred to a container to form the sticks themselves. Endowed with phenomenally rich colour, they are then encapsulated within the iconic black and gold L'Absolu Rouge cases. Thanks to its Moisture Locker Complex enriched with ProXylane, L'Absolu Rouge instantly moisturises lips, swathing them in absolute comfort. Ideally nourished, lips reveal the most radiant of colour. Eight-hour moisturisation, with instant and long-lasting comfort, coupled with intense colour that stays true… The unique L'Absolu Rouge signature. As lips have been compared to flowers for centuries in some of the most beautiful metaphors of feminine beauty, Lancôme wanted to turn a poet's dream into reality by transforming women's lips into velvety petals with vibrantly pure colour. 10 of the world's most beautiful and legendary roses were selected to create a mouth-wateringly sophisticated bouquet of brand new shades. Roses chosen for the confident strength of their colours as well as the story – or stories – behind them, offering a host of timeless tales of femininity. A vibrant fuchsia which draws its strength from the heart of the Lancôme Rose, the one and only, absolute rose. In 1973, one of the world's greatest rose growers, Georges Delbard, created the Lancôme Rose by crossing a mauve rose with a magenta variety. It was chosen among 20,000 species for its remarkable resistance and capacity for survival. This strong, full-bodied rose has an incredible ability to adapt to its environment. Symbolic of luminous, resolute femininity, it pays homage to all women the world over. An intense red inspired by the Grand Amour Rose. This incredibly hardy variety flowers continuously, its fiery red never fading. Legend has it that the rose arrived on earth with Venus, then immaculate white in colour. One day, Cupid was playing on a rose bush and was stung by a bee, causing him to bleed on the flower which then bloomed in a flamboyant scarlet red. This brilliant pink rose is derived from the Comtesse de Ségur variety, nature's most graceful and charming rose. Its name is taken from the 1858 cult novel 'Les Petites Filles Modèles" (Good little girls), due to its resemblance to the description of the château de Fleurville's roses. Its bloom unfurls fully, blossoming to reveal its hundreds of delicate pink petals. A soft and sensual rosewood shade inspired by the Amnesia Rose, a vintage flower endowed with a sturdy stem and incredibly beautiful petals in shades between beige and lilac forming a crown shape. A symbol of pure romanticism, this voluptuous rose is a favourite among brides. A mouth-watering pink whose cherry colour stems from the Carrousel rose, a flower adorned with a coloured spiral. It owes its name to 19th century carrousels – favourite attractions among children and lovers in French parks. Its velvety, vibrant pink petals feature graduated colours, giving it this unique twirling effect. Penélope Cruz and Lancôme's newest ambassadress, Lupita Nyong'o, each lend their unique femininity to L'Absolu Rouge. While the Spanish actress has infused Lancôme make-up with her sensuality and sheer emotion for some months now, L'Absolu Rouge will be the first Lancôme campaign for Lupita Nyong'o. Captured through the lens of photographer duo Mert & Marcus, the two women appear to emerge from a flower bed. Voluptuous Rose Lancôme adorns the lips of Pénelope Cruz while the Mexican-Kenyan actress wears Rouge Amour. Their nails flaunt the deep, intense pink of Vernis In Love Very In Love. The very quintessence of Lancôme femininity captured in a single image.